LOCATION This modern apartment is a stone’s throw away from Horsham town centre, a thriving historic market town with an excellent selection of national and independent retailers including a large John Lewis at Home and Waitrose store. You are spoilt for choice when it comes to activities – there is The Pavilions In The Park leisure centre with its gym and swimming pools, The Capitol Arts Centre and Everyman Cinema. For those needing to commute, Horsham Station is a ten minute stroll away, with a direct line to Gatwick (17 minutes) and London Victoria (52 minutes) and there is easy access to the M23 leading to the M25. PROPERTY The front door opens into a generous Hall with doors taking you through to all rooms and an opening which creates a Study Area/Store, that could be ideal for someone that occasionally works from home. 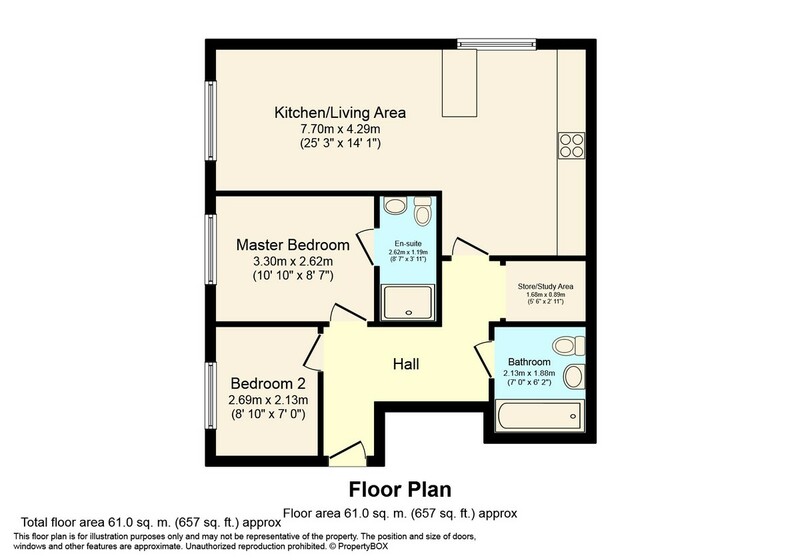 The double aspect Living/Kitchen Area is a particular feature of this Ground Floor Apartment, measuring 25’3 x 14’1, and boasting a central breakfast bar and plenty of space for your sofas, offering the ideal space to entertain. There is also a modern Family Bathroom with a white suite and two Bedrooms, with the largest being a good double with built in wardrobes and an En Suite Shower Room. OUTSIDE The conveniently located development is accessed via electric security gates which lead to the communal parking area within which is one parking space per flat. In addition to parking, there is a large bin store and shed upon an area of communal lawn.